Mendoza, J. P. and M. A. Pena (2004) Development, reproduction, and control of the Indian meal moth, Plodia interpunctella (Hubner) (Lepidoptera: Pyralidae), in stored seed garlic in Mexico. J. Stored Prod. Res., 40: 409-421. 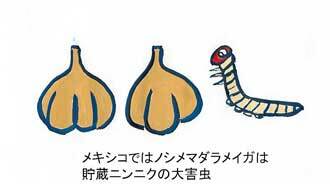 Rahman, G. K. M. M. and N. Motoyama (2000) Repellent effect of garlic against stored product pests. J. Pesticide Sci., 25: 247-252.